The Lagoon Nebula is a giant interstellar cloud in the constellation Sagittarius. It is classified as an emission nebula and as an H II region. The Lagoon Nebula is estimated to be 4,100 light-years from the Earth. 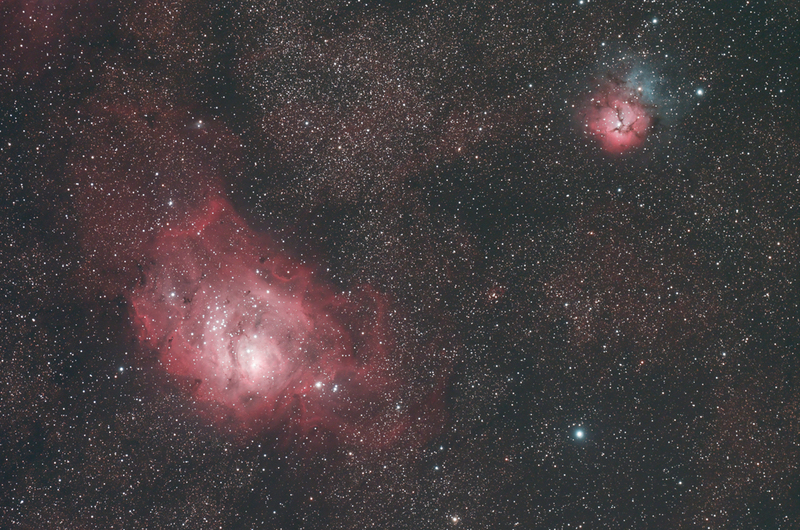 Like many nebulas, it appears pink in time-exposure color photos... The nebula contains a number of Bok globules - dark, collapsing clouds of protostellar material. It also includes a funnel-like or tornado-like structure caused by a hot O-type star that pours out ultraviolet light, heating and ionizing gases on the surface of the nebula. Object very low on horizon between 14° and 33° altitude, so seeing was not ideal. Fantastic dark site in the farm from my brother in Northeast of Brazil.